After a particularly busy and eventful week I’m heading back to civilisation (Lisbon) for a couple of weeks. The main activity of the past week has been planting new vines, in the form of cuttings harvested from the vines of a local wine grower. This involved plenty of digging and, since they require protection from the elements in their early life, a mulch of bracken. The idea was to harvest dead bracken from a field up the road, bundle it all into the truck and spread it on the vines. We have finally managed to cover them all, after three truckloads! Unfortunately the fruits of our labour will not be available (at least in a liquid alcohol form) for another 3-4years, which is how long it will take for the vines to yield sufficiently to make wine. I’m beginning to wish I could be here for October (grape harvest season). Maybe another year. Although they’re hard to see in this photo, this whole bank is now planted with vine cuttings. The little barriers, made of broom, are to catch eroding soil and eventually create paths to access them. 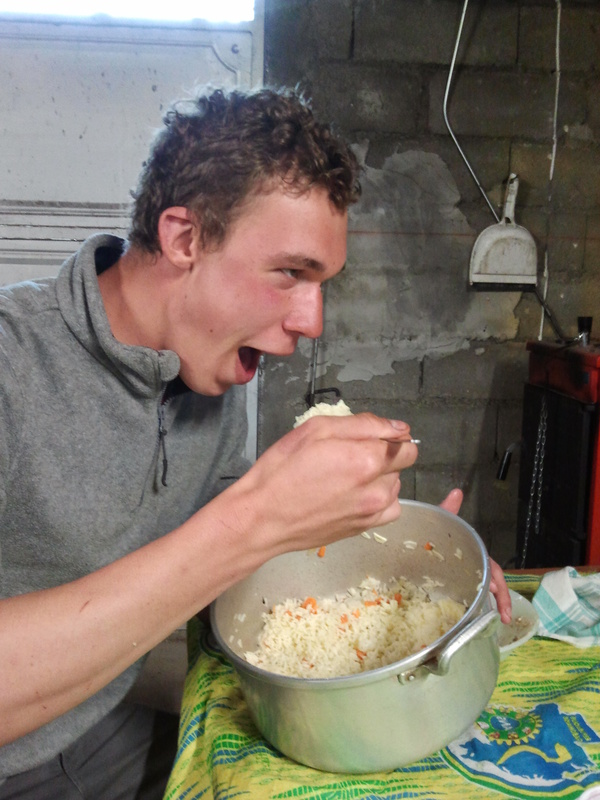 Last weekend we were invited by Nelson, Andrea and Jeroen’s friend, for a big lunch with his family. The food was very good; a traditional goat stew (goat provided by Casalinho, naturally, everything else by our hosts). I managed to eat enough to gain the right to eat desert straight from the bowl it was served in after my third helping of stew. Lunch was followed by a trip to the pub, an aguadente to ease digestion and some memorable table football rivalry! Serge’s dedication to clearing the table impressed everyone! Other highlights of the past few days included my first solo goatherd experience. I was managing quite well until they escaped my control by jumping over a wall to terrorise Andrea’s cabbage patch. A few minutes of shouting and waving a stick at them (traditional Casalinho goatherding methods) had them back in the pasture before too long. The WWOOFers also received a lesson in goat’s cheese making from Andrea, followed the next day by a tasting of the cheese we had produced. well it’s good to know you are passing on those natural goat management tips, Andrea! Shouting and Stick-waving are under-represented in traditional smallholding literature, I feel. We’ve enjoyed these accounts. Keep up the good work.